Women's suicide rate in Gujarat, two other states rises, as India's goes down by 23%: Wither UN's SDG targets? In an important revelation, a recent study in one of the world’s most renowned health research journals, “Lancet”, has found that “model” Gujarat is one of the three states where the Suicide Death Rate (SDR) among women has gone up. 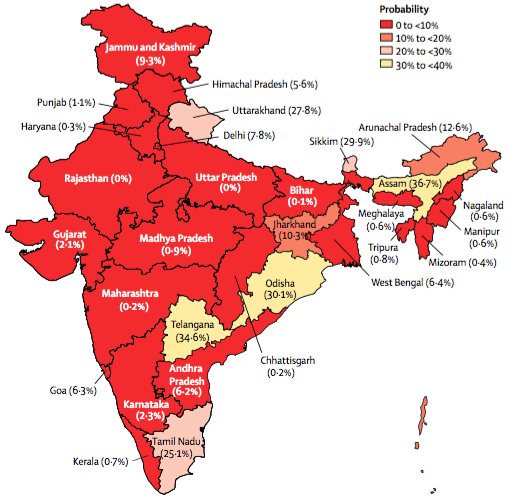 The other two major states, whose women’s SDR has shown an upward trend during the 26-years study – 1990 to 2016 – period are Bihar and Rajasthan. Pointing out that between 1990 and 2016 women’s SDR has increased by 4.1%, the data in the journal show that crude SDR for women in Gujarat 1990 was 15.4 per 100,000, which reached 16.0 per 100,000. The data is significant, because all other states but these three witnessed a sharp fall in women’s SDR. What is equally significant is that, women’s all-India SDR stood at 19.4 per 100,000 in 1990, which was above that of Gujarat. However, in 2016, things turned topsy-turvy: The all-India women’s SDR in 2016 was 14.9 per 100,000, much lower than that of Gujarat, 16.0. Overall, India experienced a whopping fall of 23.5% in women's SDR during the period under study, as against 4.1% rise of India. Importantly, there are only major five states whose women’s SDR is found to be higher that of Gujarat – these are Tamil Nadu 26.9, West Bengal 22.1, Karnataka 25.1, Andhra Pradesh 21.0, and Telangana 19.8. The women’s SDR in these states remains high despite a fall experienced in the 26 years in each of these states, the data show. Also, though in Bihar women’s SDR experienced a sharp rise of 13.5%, it continued to be way below that of Gujarat, just about 6.2 per 100,000 in 2016, up from 5.1 in 1990. Similarly, while Rajasthan’s women’s SDR rose by 10.4% during the period under study, its SDR for 2016 was way below that of Gujarat, 8.3, up from 7.6 in 1990. 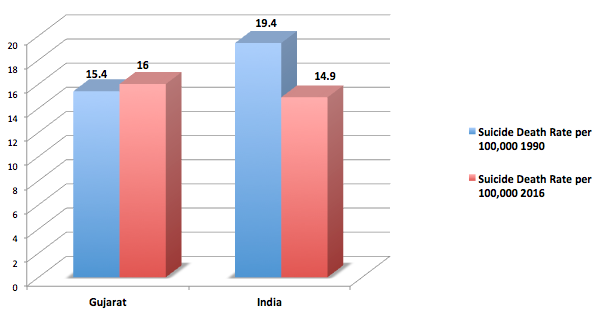 It underlines, “Married women account for the highest proportion of suicide deaths among women in India. Marriage is known to be less protective against suicide for women because of arranged and early marriage, young motherhood, low social status, domestic violence, and economic dependence”.